The government points to an exception to this rule, which allows arrest and detention in cases where lawmakers are caught in flagrante delicto—in the act of committing a crime. Lawmakers from opposing sides of Cambodia’s political divide have sparred over their differing interpretations of parliamentary immunity, amid questions over whether recent arrests and an attempted arrest of opposition parliamentarians have undermined the principle. The Cambodia National Rescue Party’s (CNRP) Ou Chanroth and Chheang Vun of the Cambodian People’s Party (CPP) both appeared on the Hello VOA program on May 31. The encounter followed the arrests of Senator Hong Sok Hour in August last year, and National Assembly member Um Sam An in April, as well as the more recent attempt by armed security forces to arrest CNRP Vice-President Kem Sohka at the main opposition party’s headquarters on May 26. 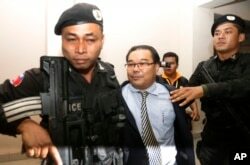 Opposition senator Hong Sok Hour, center, is escorted by riot police officers at Phnom Penh Municipal Court, in Phnom Penh, Cambodia, Saturday, Aug. 15, 2015. Local and international observers say the cases raise questions about how authorities are applying the principle of parliamentary immunity in Cambodia. Under Article 80 of the Constitution, “no assembly member shall be prosecuted, detained or arrested because of opinions expressed during the exercise of his [or her] duties.” It takes a two-thirds parliamentary majority to strip a lawmaker of this immunity. Chheang Vun told VOA Khmer listeners the principle of immunity was designed to protect lawmakers while performing their parliamentary duties. But he said lawmakers could not use their immunity to abuse the rights of others or to breach national traditions, public order and national security. In Kem Sokha’s case, the opposition leader’s multiple refusals to appear in court can be considered as being caught in the act of a crime, Chheang Vun claimed. He said an extraordinary meeting of the National Assembly on May 30 had allowed the court to continue its action against Kem Sokha, but not to strip him of his parliamentary immunity. Ou Chanroth said Kem Sokha’s circumstances did not fit with a common-sense understanding of a “crime immediately seen in action,” arguing that once a few days have passed from an alleged crime, the principle of flagrante delicto no longer applied. If ignoring a court summons constituted being caught in the act of a crime, “there will be a lot of people who will be imprisoned,” he added. 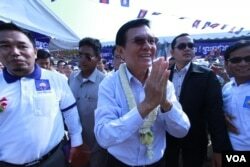 Responding to a question from a listener posted on VOA Khmer’s Facebook page, Chheang Vun angrily rejected the questioner’s comparison between Kem Sokha’s decision not to attend court and CPP stalwart and National Assembly President Heng Samrin’s refusal to appear at the Khmer Rouge Tribunal to give evidence. Chheang Vun described the question as “regrettable,” and appealed to the questioner to think “as a human being,” not as “an animal.” The analogy was like comparing high-value hardwood with rotten wood, he said.